Rachel has started a weekly column in The Guardian called “Kitchen Sink Tales.” Each column starts with a photo of her Roman sink, filled with the freshest of produce straight from the market. Already her stories and recipes have sent me out to the store and then to the stove to cook up warm, inviting, homey dishes. 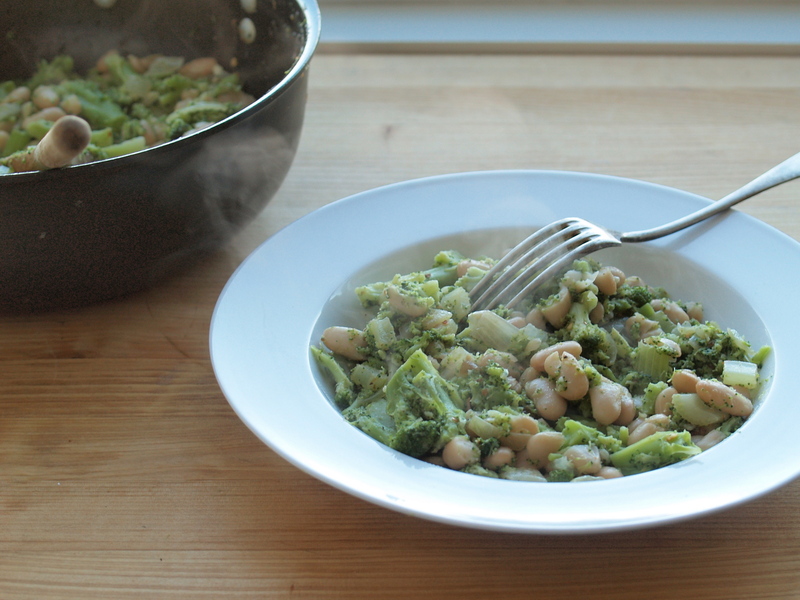 Most recently I created a mishmash of two of her recipes: broccoli ripassati and white beans with wilted greens. I started with the broccoli. In the original recipe, you boil a couple heads until they’re almost water-logged cafeteria fare. I know that doesn’t sound appealing, but bear with me; luckily you don’t stop there. You cook the broccoli even more, this time in a pan with a nice glug of olive oil, garlic and red pepper until it forms a creamy sauce excellent for tossing with pasta or topping toast (with a fried egg for good measure). I made the broccoli and stopped just shy of sauce for a chunkier version. I mixed the broccoli with a can of cannelini beans spiffed up, à la Rachel’s wilted greens recipe, with some celery and onion that I had chopped but didn’t need for stuffing. Sure, it might be better with dried beans, lovingly soaked overnight and simmered for an hour or two, but I had what I had and I was thrilled with the results. What ended up in the bowl wasn’t company fare, really, but perfect for a hearty stay-at-home lunch. 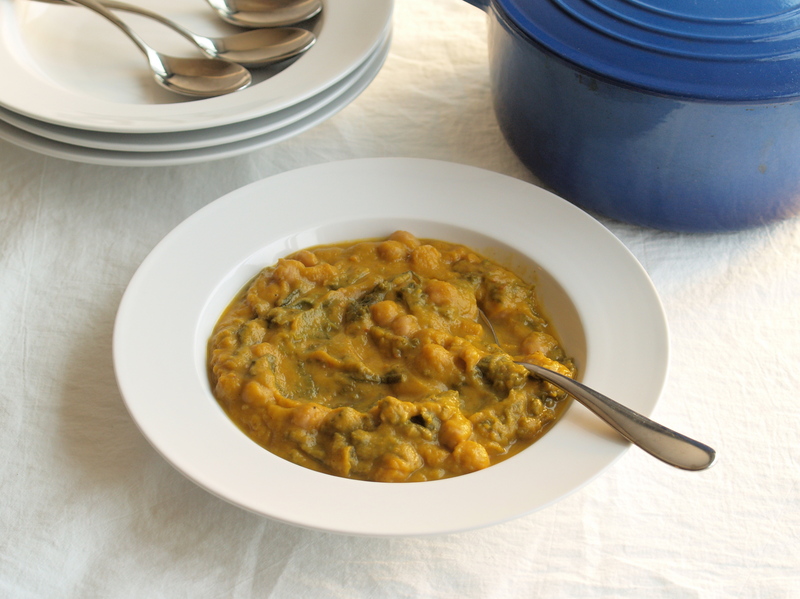 Adapted from Rachel Roddy’s recipe for broccoli ripassati and white beans with wilted greens. Boil. Bring a large pot of well-salted water to a fast boil – depending on the size of your pot, this may take quite some time. Get started on the rest of the recipe while you wait (and wait and wait). Cook. Meanwhile, heat 2 tablespoons olive oil in a large deep frying pan over a medium flame. Cook the onions and celery until softened and fragrant and the onions turn translucent, about 7-8 minutes. Drop the flame to low and add the beans, a 1/2 teaspoon salt, a few grinds of pepper and 1/4 cup of the boiling water. Heat the beans, stirring gently, until warm, about 5 minutes. Empty into a bowl and set aside. Taste for for salt and pepper and adjust seasoning. Don’t clean the pan – you’ll be using it in just a moment. Keep boiling. By now, your huge pot of salty water is vigorously boiling. Add the broccoli and cook until they can easily be pierced by a fork, around 5-7 minutes. Saute. While the broccoli is boiling, in the frying pan that you just cleared the beans out of, warm the remaining 2 tablespoons olive oil over a low flame. Gently saute the garlic and 1 teaspoon red pepper flakes (you can always add more later) for 3-4 minutes, being careful not to burn the garlic. Cook. Use a slotted spoon to lift the cooked broccoli from the water into the frying pan with the garlic. Raise the flame to medium-low and move the broccoli around the pan so each piece is well-coated with the garlic-pepper mix. Allow the broccoli to stew for a few minutes, stirring with a wooden spoon, during which time it will break up, taking on an almost creamy aspect with a few stalks still recognizable. Stir. Add the bean mixture to the pan with the broccoli and stir to warm everything up again, another couple of minutes. Serve. I ate this as is, but I imagine it would be great with a squeeze of lemon and a shower of parmesan. 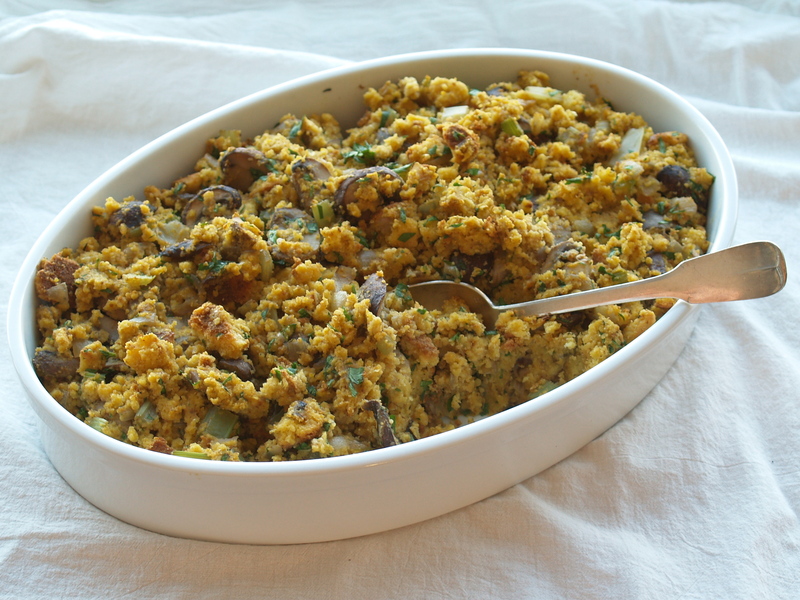 It’s T minus six days to Thanksgiving and I’ve got a quick recipe to share: mushroom stuffing made with cornbread. 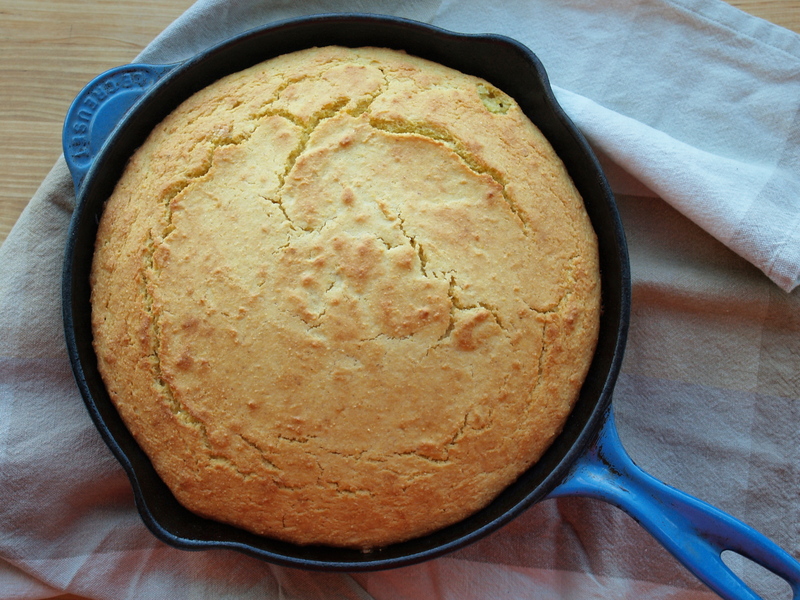 First, I tweaked the cornbread I’ve made here before, mainly upping the amount of corn and sugar. It’s so good that I was worried that my nibbles here and there (and here and there) were going to require me to make up a second batch for the stuffing, but I restrained myself and had just enough left after an overnight stale that the one batch sufficed. But it was touch and go for a while there. I’ve used the cornbread in a sweeter stuffing before, mixing it with apples, aromatics, and some turkey-friendly herbs. But I think I prefer this year’s version – it’s got the same aromatics (celery and onion) and a whole lot of mushrooms. It takes its flavor cues from how my mom prepares the Pepperidge Farm crouton mix that we traditionally use (and love). Anyway, the Forward published this recipe yesterday, and I wanted to put it here too. Enjoy! Adapted from Cooking Light Annual Recipes 2004 Cookbook and updated an older recipe on this blog. Pureeing corn with water in a blender for a couple of minutes creates a thick non-dairy substitute for the milk that’s normally in cornbread. Baking it in a pre-heated, very hot skillet results in an nice brown bottom crust. Prepare. Preheat oven to 450˚F. Place a 9-inch round cast iron skillet into the oven. Blend. In a blender or food processor, blend the corn, oil and water for two minutes until smooth. Add the eggs and pulse a few times until combined. Mix. In a medium bowl, mix together the flour, cornmeal, sugar, salt and baking powder. Add the wet mixture to the bowl and stir until incorporated. Bake. Using an oven mitt, pull the cast iron skillet out of the oven and drizzle with oil, swirling to cover the bottom and sides of the skillet. Add the corn bread batter to the skillet and bake until the top is golden and a toothpick comes out clean, about 25 minutes. Adapted from the New York Times. Prepare the cornbread recipe and then crumble and spread out on two sheet pans, allowing to dry overnight or longer or for at least 20 minutes in a 150˚F oven. Prepare. Preheat oven to 325˚F. Grease a 9- by 13-inch or similarly sized (12-cup) shallow baking pan. Saute. In a large, deep skillet, heat butter over medium heat. Add onion, celery and garlic. Sauté, stirring for 5–7 minutes, until tender. Add mushrooms and thyme, and season with salt and pepper. Continue cooking until the mushrooms release their liquid (about 5 minutes) and then resorb it (another 10 minutes). Taste for salt and pepper. Mix. In a large bowl, combine the mushrooms, parsley and cornbread. Mix in the stock to moisten the cornbread. Transfer to greased baking pan. Bake. Cover the pan with foil and bake for 20 minutes. Uncover and bake until the top is lightly browned, another 15 minutes. Serve hot. I received an email the other day. The subject: Made this soup and thought of you. The message was from my friend Nachama who I met in Boston several years back. We lived just a few blocks from each other and used to go to the gym together. It’s hard for me to motivate to exercise, so it was great having a buddy. She’d run on the treadmill, I’d swoosh along on the elliptical, and we’d meet up at the end to stretch. This was all the impetus I needed to pull out a large pot and get cooking this chickpea soup that, according to recipe, hails from Madagascar. Its base is a sweet potato broth that you make from scratch (or buy in a box). Toast a handful of spices (including types of red chile) with garlic, then add the broth, a splash of coconut milk, and a big pile of spicy mustard greens, and chickpeas. After an hour and a half, the greens wilt into the broth and the whole mess thickens to a stew. I invited over some friends and we crowded around my table to finish most of the pot. We ate it with spoons, but forks would have worked just as well. Thanks, Nachama, for the recipe and inspiration! Adapted from this recipe. If you don’t want to make the broth from scratch, either substitute with sweet potato broth, or make a semi-homemade broth by simmering 3 sweet potatoes in 8 cups of vegetable broth and then pureeing with an immersion blender. Cook. Heat olive oil in a large stockpot over medium heat. Add onion, celery, and carrot. Cook, stirring often, 8 to 10 minutes or until vegetables are tender. Add sweet potato, desired amount of kosher salt and freshly ground black pepper, and water. Increase heat to high, and bring to a boil. Simmer. Reduce heat to medium-low, and simmer 30 to 35 minutes or until sweet potato is tender. Discard cloves. Let mixture stand 15 minutes. Puree. Use an immersion blender to puree until smooth. Season with salt and pepper. Use immediately, or cool completely, and refrigerate in an airtight container up to 5 days. Toast. Sauté garlic in hot oil in a large saucepan over medium heat 1 minute; add red peppers, coriander, and turmeric. Cook 1 to 2 more minutes or until fragrant. Boil. Stir in sweet potato broth, coconut milk, and greens. Bring to a gentle boil; add chickpeas. Simmer. Reduce heat to low, and simmer about 1 1/2 hours or until greens are soft. Season to taste with salt and pepper.